A cappella Zoo: A Magazine of Magic Realism & Slipstream, Issue 10: Bestiary: The Best of the Inaugural Demi-Decade of A cappella Zoo, Spring 2013 (March). Pp. 330. ISSN 1945-7480. $9.00. A cappella Zoo is a journal of magic realism and slipstream fiction and poetry, currently edited by Amanda Lyn DiSanto and Lisa McCool-Grime. Founded in 2008, A cappella Zoo has made a bit of a splash with imaginative and evocative stories of the fantastic. The tenth issue, titled Bestiary, is an anthology of the best work from the magazine’s first five years. 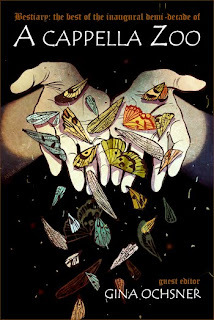 The defining characteristic of magic realism is the introduction of fantastic elements into a familiar, everyday environment; the story typically draws its energy from the reaction of ordinary characters to a bizarre situation. Often, the overarching mood of the piece is one of yearning—the longing of people in our mundane world for the escape and meaning symbolized by the supernatural, and conversely, the desire of the fanciful character at the center of the story to be “normal”. The guest editor for this issue, Oregon writer Gina Ochsner, talks in her introductory interview about “the primal need for narrative in which the otherworldly, the strange, the supernatural is … allowed to visibly collide with the known ‘real’ world.” Her selections for this special issue demonstrate a variety of aspects of this collision. 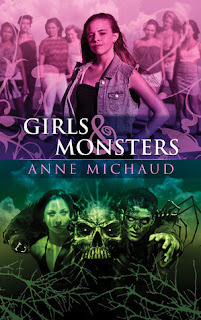 Anne Michaud, Girls & Monsters. Dark Fuse, 2013. Pp. 158. ISBN 978-1-9377718-4-3. $3.99 (e-book)/$16.99 (paperback). 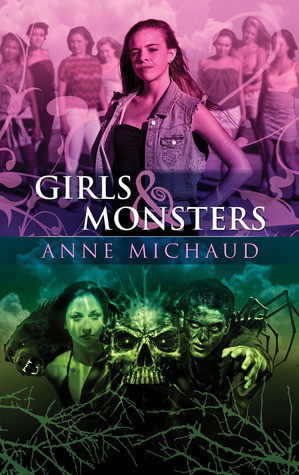 Girls & Monsters by Canada-based author Anne Michaud, is published by Dark Fuse, a small press specializing in horror, thriller, crime, and other suspenseful genres. This is a dark collection of five Young Adult novellas about five young girls who face the monster within, under the bed, in the neighbouring house or while travelling. The book has a broad range of horror plots and you’ll meet classic monsters like the ghost, the mermaid and the scientist, but there are also some surprises. I believe most women readers would identify with at least one or two of the girls, who struggle not only with monsters, but with the typical hazards of growing up as teenage girls. The book is well written and fast-paced, very entertaining and is well worth reading for all ages. Kelly Jennings and Shay Darrach (edd. 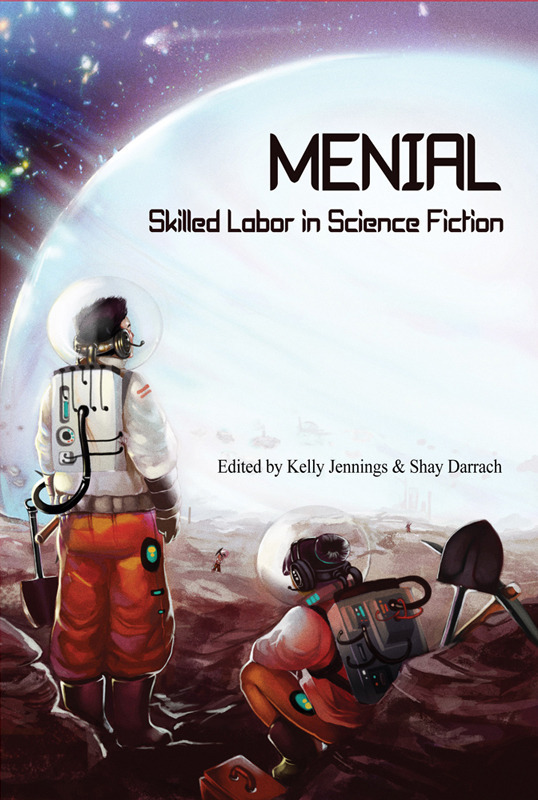 ), Menial: Skilled Labor in Science Fiction. Crossed Genres, 2013. Pp. 146. ISBN 978-0-6157056-1-3. $11.95. The future is full of sprawling cities and colonized alien worlds. Cityscapes tower above placid lakes and human economies span the solar system. While most science fiction stories focus on the shiny technologies of the future and heroes who wield them, we don’t often stop to consider the builders, clerks, and cleaners. In Menial: Skilled Labor in Science Fiction, edited by Kelly Jennings and Shay Darrach (published by Crossed Genres), seventeen short stories explore the future of the worker. Being from the working class, I have an affinity for the people who work behind the scenes, on whose labour we entirely depend to make our lives safer and more convenient. I was certainly pleased to see a volume of SF compiled around the theme of labour.